Our 7 days private Morocco tour from Marrakech starts today travelling over the Tizi n'Tichka mountain pass and we will enjoy beautiful views of the High Atlas mountains. 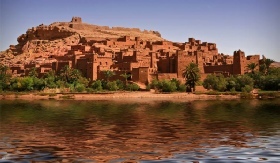 We pass few Berber villages on the way to the World heritage site of Ait Benhaddou. This kasbah was used as a backdrop for many famous movies. 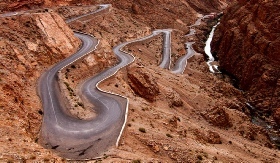 Then we will drive to Ouarzazate to visit movie studios and we continue towards the Valley of Roses and the Dades gorges. Hhere we stay overnight at a local hotel. After breakfast, we head to visit Todra Gorges. Berber villages are scattered along the way.You will pass through Tinjdad, Jorf and Erfoud ,famous for its fossils. From here you will feel the beginning of the Saharan oasis of Tafilalet. Then we continue to Merzouga. After arrival here we stay in local desert hotel for dinner overnight stay. DAY 2: DADES GORGES - TODRA GORGES – ERFOUD - MERZOUGA. After breakfast and shower,you will go in a tour around the Erg Chebbi ,you will visit a berber house and listen to local gnawa music; originally from Ghana, and Sudan. You will visit some deserted mines, Berber nomad sand oasis of palm trees. Towards lunchtime, return to Merzouga , lunch and relaxing,then you will go to the camels who are waiting to take you on an adventure in the sand dunes. 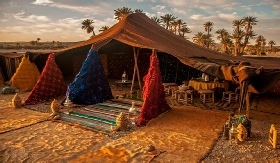 You will spend the night in an equipped camp with drums music in the middle of the Sahara,this is a great opportunity to take lovely pictures of the sunset and sunrise,when you arrive at the camp, you will go to a high dunes to see the sunset ,you will spend the night in nomad tents where dinner is served under the stars. Wake early to watch the sunrise and, if you overnight under the stars in the deep camp, camel trek back to the dune line. After breakfast departure for Fes via Ziz Valley Gorge and cedar forests where Barbary Macaques live – it is an interesting route with a stop for lunch in a Berber café. Drop off at your accommodation in Fes. 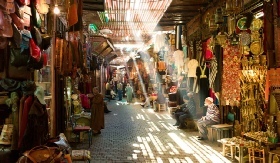 You will have a guided tour to explore the old medina and the famous Souks of Fes - its narrow cobbled streets are filled with ancient mosques and towering green-glazed minarets. You will visit the most beautiful palaces and monuments of Fes. 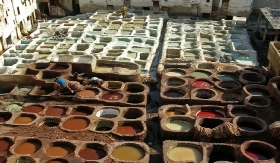 The tour will include a visit to the tannery and the ceramics cooperative to see the traditional Moroccan crafts. Today we drive from Fez to Casablanca. We will visit Roman ruins in Volubilis, and also Meknes. In Meknes - former imperial city in Morocco, also known as the Ismaili capital of Morocco, we will visit places as : the famous gate Bab Mansour, the Sahrij Souani Bassin. Then we visitthe Mulay Ismail Mausoleum . We arrive to Rabat to visit most important places here. The city tour of Rabat will start at the Royal palace , then we may visit Chellah nechropolis , Hassan tour and Mohamed the 5th mausoleum. We continue to visit the Oudaya kasbah. 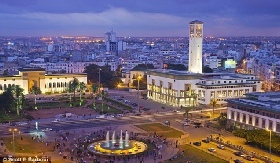 Then we head to Casablanca where we will visit the Central Market, the Habous district, Royal Palace, Mohamed V Square, the residential area of Anfa and the outside of Mosque Hassan II. Overnight Casablanca in local hotel. Today we transfer you from Casablanca to Marrakech.